It doesn't take long for the butterflies and bees to find new nectar plants. 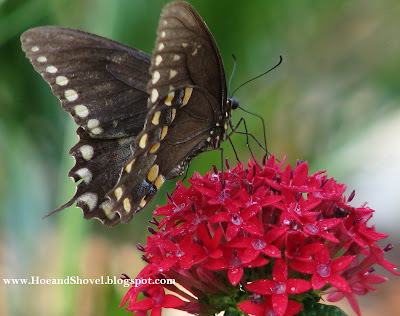 Soon after the crimson red Pentas were planted the regular visitors made a stop by the brightly colored attracters. What a flurry of critter activity the newly planted front bed has invited as more turf was exchanged for plants. Extending the menu and adding a few new choices has caused delight for them and for us. Not all visitors come to sip. Some come to chomp. The Tersa Sphinx Hummingbird Moth cat has taken down an entire branch as it grows to a long and plump whopping 3 inches. It's okay with me, soon it will bury itself into the ground for a couple of weeks to become another pretty flying delight. There are many factors to consider when beginning a new planter bed. This particular front garden project was especially interesting as it borders the street we live on. A designing element which I found provokes some consideration beyond the routine backyard bed. The yard is slightly-sloping downward to the street. It is a west facing sunny spot from mid-morning until late afternoon. A factor I don't deal with any where else except in the veggie garden on the north side of the house. Once the shape of the bed was determined the first order of business was to dig up all the sod and you can read about that here. This monumental task was achieved slowly over a week's time working the early morning hours (first day July 3) and the late evening hours when the days' schedule allowed. Side note: So many of you asked to see the 'reveal' for this area even though every plant is in its juvenile stage which offers very little to be impressed with in performance. 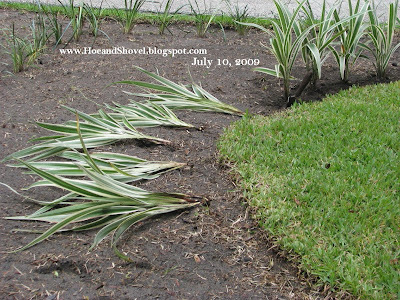 This is one of those posts that runs on and on with detail a non-Florida gardener will likely not appreciate. Feel free to scroll through the photos or read word for word if you like. I sincerely appreciate that you've taken a few minutes out of your day to drop by. It was tedious to write even for a chatty gardener like me who can 'talk 'about plants all day long. I'm aware most don't have time to "read" and we like to see photos and move along. Believe me, I would have been happy with throwing up some photos and saving my brain power. LOL This will be one of those posts I end up referring to for the sake of record keeping as this area develops to maturity. Feel free to leave a comment and let me know your thoughts... whether you read or look... it's so delightful to hear from you. Whenever I start carving out more grass its important to blend the new area with the rest of the garden and yet to create a planting design that stands on its own with unique and interesting features. Sounds strange I know, but the inspiration and spark that got this challenge in gear was the plan to use as many of my own plants as possible. The two plants that got my creative energies flowing and served as a launching point for the choices of plants to follow were the two that would bond this sight with the existing gardens. They had to go in first in order to see how much space was left after their placement. Creating the interior border I used the easy-to-grow, easy-to-maintain variegated beauties I've come to admire and depend on so much throughout the garden. 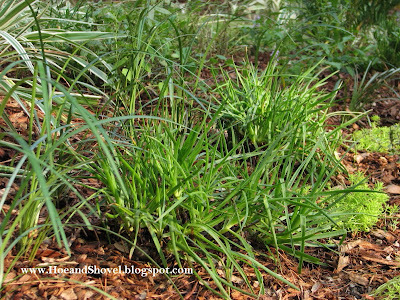 In went 65 starter-size divisions of Variegated Flax Lily, Dianella tasmanica 'Variegata' dug up and divided (seen above) from the back gardens. It is my habit to plant young divisions just far enough apart to allow room for growth but closer than expected to avoid any ground or space between each clump once the plant reaches its fullness. Its strappy, light green and cream leaves add just the right amount of brightness I wanted for the border. A " winding ribbon" of Liriope 'Gigantica' dug up from a pathway that leads the front garden to the back garden went in after the Flax Lily border. My intention here was to weave the curving Liriope ribbon in a direction almost opposite but just off enough not to appear exact opposite of the outline of the border plants. I hope you can see what I mean in the photo above. There are some elements in any design that should be unpredictable- maybe that's just me. 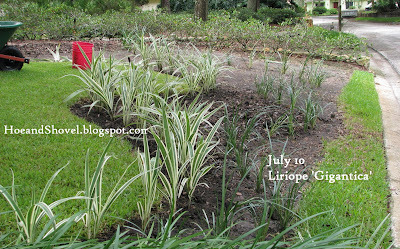 Curving the Liriope deeply into the corner away from the border accomplished two things for me. 1) It gave the awkward, harshly squared (far) corner of the new space a bit of softness it lacked and 2) it offers a sense of having delineated areas within the widest portion of the bed . Once those two plants were in place, I felt as if I could introduce some brand new choices. Plants I've had my eye on perhaps but didn't have a good location for them. Oh, there's still room for more cuttings and transplants but prospects for adventure, too. We're ready now for 20 newly-shipped purple Muhly Grass 3-inch plants shipped from Santa Rosa Gardens. This gardener is very used to crowding plants closer together than recommended spacing. So it was with utter discipline the grasses were placed at least 2- 3 feet apart allowing for maximum expansion upon maturity. Placing them on both sides of the curvy ribbon of Liriope further softened the deep, square corner and added to its new personality. 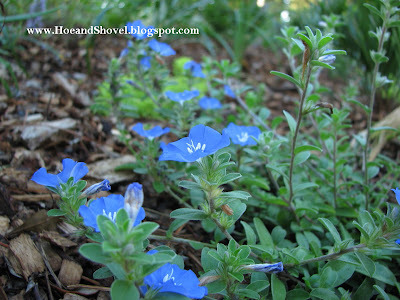 An element that won't fully be appreciated until the planting bed matures. 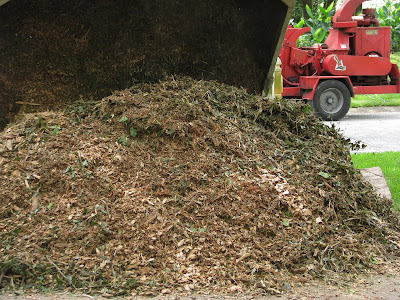 You may remember the story of the free mulch? A convenient layer of yummy oak chips was being added as each section of the planting was completed. It was time for a trip to the garden center. Oh, I was so tempted to put lots of flowers and blooms in this sunny location. But I kept my head and remembered my goal to add mostly Florida-friendly plants and natives. 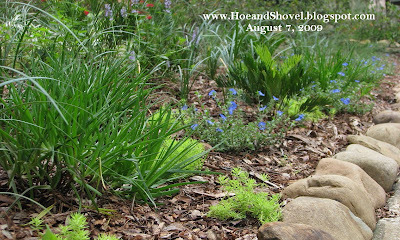 This way I'd have a really good foundational planting bed that will last through every season without too much fuss. Later when I see how it fills in I can add some fun annuals if I choose. 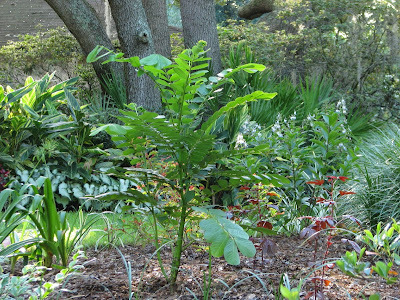 Zamia floridana or Coontie plant is perfect for xeriscapes and as a low maintenance ground cover and foundational plant. As a slow grower it will take just about any type of weather condition Florida can throw at them. Whether it be drought, frost, heat, or humidity they will persevere. They are a little pricey averaging $25 each. My favorite little local nursery sold five of them to me for $15 each because they were "small". Worked for me. 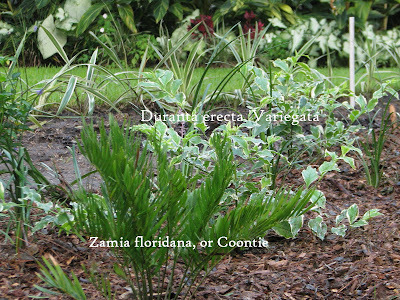 Three Duranta erecta 'variegata' were also added for the light green and cream foliage variation in the space. I'm so all about foliage versus showy flowers and what will attract butterflies and birds these days. 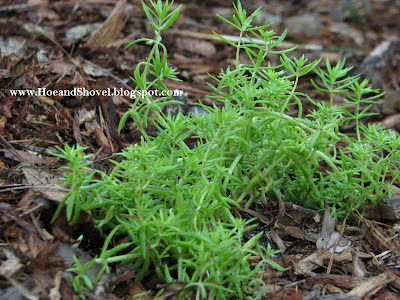 For the street-side edge ground cover Florida Friendly Gold Sedum, a hybrid brought here from Europe by the helpful folks at Riverview Flower Farm's Florida Friendly Plants. (Thank you, Rick- I LOVE this plant.) With its brightly colored chartreuse softness it will spread quickly and adds great texture and drought tolerance to the outside border. 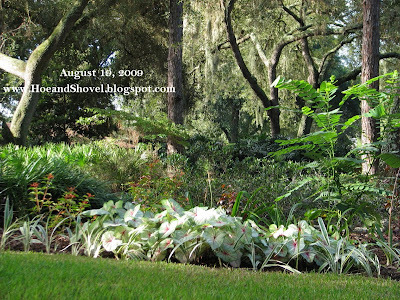 Speaking of Florida Friendly expert Rick Brown over at Riverview Flowers Farm's Florida Friendly Plants blog ... I was convinced from another of his recent posts that Bulbine Jelly Burn Plant would be a favorable addition to the street border as well. So far it has not disappointed... for ease of transplant, adjusting to its new sunny home, and now has begun to shoot up its yellow/orange blooms. I bought one 3-gallon plant and divided it into 3 before ever placing it in the ground. It should spread and blend in nicely next to the Florida Friendly Gold Sedum. All along-- meaning before I even started this project-- I had my hopes set on placing a small blooming tree in the narrowing section of the new bed where the ground levels. After much research and then literally running out of room for one, I decided on an in-between option. A (very) fast growing Cassia Alata has turned out to be an unplanned focal point. It was two feet when planted and now stands taller than 5 feet. That's over 3 feet of growth in about 8 weeks. Yikes. It's going to be a fun one to watch (and to keep pruned) over time. It was particularly attractive to me for its unusal texture of foliage and knowing it serves as a host plant for sulphur butterflies was a big draw. 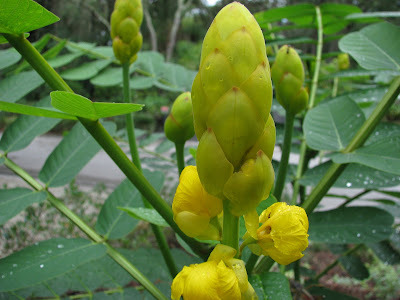 It is commonly referred to as candle plant because of the shape of the blooms. In this short amount of time, blooms have shot up from the new growth and sulphurs have been seen dropping their eggs. Good things in a garden! It seemed appropriate to keep low and spreading plant choices next to the street because of the slightly downward slope and visibility. But when it came to the section that levels off and narrows into the neighbor's existing border, some taller picks were in order. 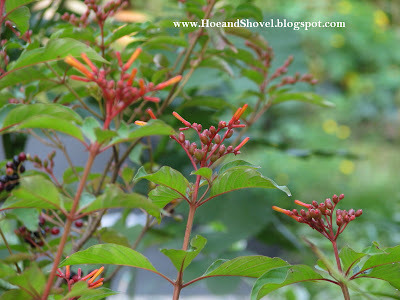 Two native Hamelia patens, Firebush chosen for their reddish stems and red and yellow tubular flowers that are so appealing to butterflies and hummingbirds were a must. In the fall they provide berries for the birds. I have several in the back and knew I wanted more in this expansion. Completely unplanned and unforeseen, a nicely sized and well-priced Clerodendrum ugandense or blue butterfly bush found its way onto my cart while browsing around my favorite local nursery. Even the strongest will sometimes gives way when strolling through the garden center. Can you see the resemblance to a butterfly in the sweet individual flowers? As with most Clerodendrums it can get out of hand in height but can be kept in check by simply pruning. It roots from cuttings easily and flowers almost continually in our climate. A view of the progress as of July 12- day 9 into the project. 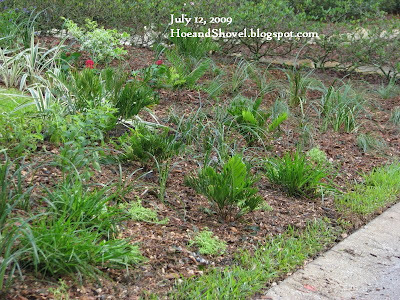 A few transplanted seedlings from cuttings of colorful foliage plants we favor at Hoe and Shovel were added for filler. 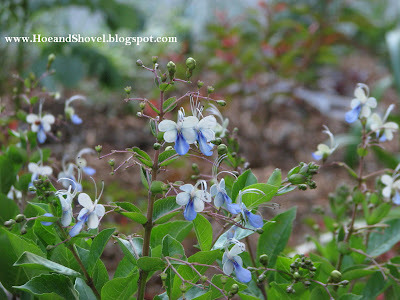 Three Strobilanthes dyerianus, Persian Shield went in next to the red pentas and the Blue Porterweed. 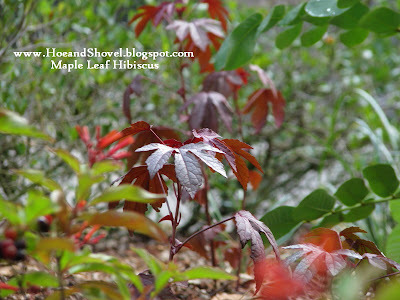 Cuttings of Hibiscus acetosella or maple-leaf hibiscus add more texture and color. Its leaf color is, for this zone, uniquely deeply hued all year long. Its blooms are not particularly showy. They are the same color as the plant. An intriguing virtue that attracts me to it. Besides, it loves the sun, it roots from cuttings, it grows very fast and will come back quickly after a frost. 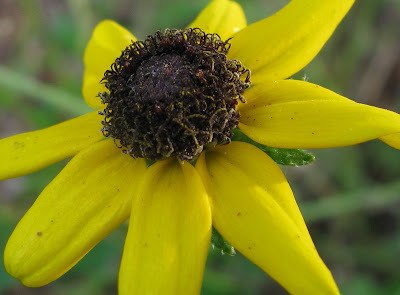 To fill in one of the curvy spaces I moved (from the back) two Rudbekia hirta ... Black-eyed Susans. Purchased at the native plant nursery way back in April, they weren't performing too well in my less-than-exciting wildflower patch in the back. Even now, not showing significant progress, they are at least blooming in their sunnier, sloping new home. Almost the last thing to do was to remove that final strip of grass next to the street. 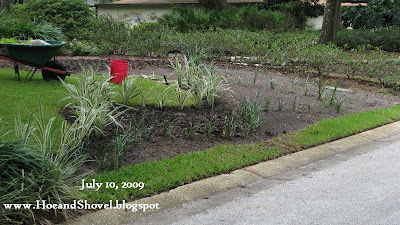 It was left during the length of the renovation in order to keep the soil and mulch from washing out with our usual pattern of heavy summer rains. 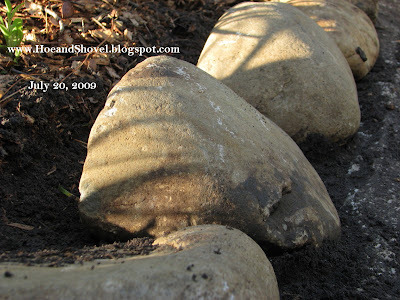 Natural stones were placed side by side the length of the new planter bed to serve the same purpose of retaining the soil and mulch for years to come. Feeling the need for additional ground cover I added Evolvulus glomeratus blue daze across the front after the stones were placed. My idea is that it might tumble over the stone a bit for cheery color next to the street. There were 39 transplanted Society Garlic curved behind the Flax Lily in a few places, 18 Agapanthus transplanted curving next to the Cassia, lots of rain lilies transplanted beside them. 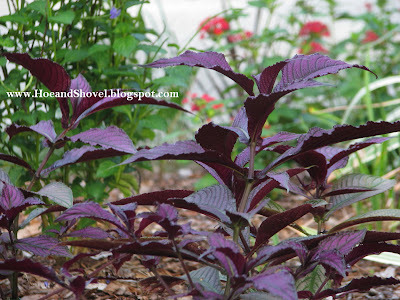 I almost forgot, 5 Agastache Black Adder shipped from Santa Rosa Gardens were added. A very new-to-me plant I wanted to try in this climate. On July 22 the project was completed. Turns out those anticipated summer rains that were supposed to help get everything established were scarce during these weeks. So there was much attention given with a watering hose. But now that every thing is well underway and nothing has been lost, there is no need for hoses or extra watering. Ahhh... the goal of low-maintenance gardening has been accomplished! A few Gaillardia (bottom left corner) left over from seed pots in the spring were put in a corner to see if they might be happy in this location next to the street. This is definitely the largest planting bed I've tackled (from nothing) at one time in my garden. All the others were done gradually, systematically enlarging smaller beds that I started over the years. A view from the driveway reveals the tightly clumping Florida Fantasy Caladiums that sprouted up quickly in the summer warmth. They are in front of the Agapanthus transplants. If there's an award for The. Longest. Post. Ever. Oh my! Yes it was a bit wordy, but Oh so worth the time to read it!! Looks so nice....I think I have that Maple Leaf Hibiscus...been waiting for a bloom to make sure. Some said it might be Castor Bean, some said Red Leaf Hibiscus??? Your Firebush, is that the one that can get up to 15 feet tall in the right conditions...mine is growing quickly. We have a lot of the same plants...makes me feel proud to know that! Cassia Alata I believe is the host plant for Clouded Sulphur Butterflies. 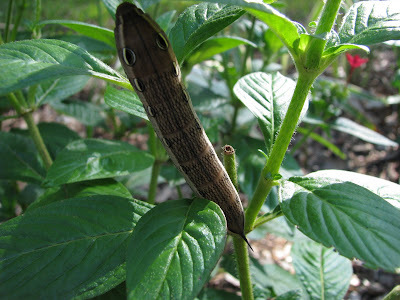 I have some caterpillars on mine...Drop by and see what I'm raising on the front porch..
You deserve to fill up as long of a post as you want after all of this work. WOW It is simply gorgeous. This reminds me of how far south you are gardening. I see many flowers I use as annuals here in your new planting bed. Gosh it is so full already. In your climate it will be stuffed before too long. Just wonderful. I loved every little itty bitty detail. It has turned out so beautifully! What an amazing gardener you are!!! Your ideas are wonderful, and I especially admire how you put in all the effort required to make it happen. I don't know about northerners, but this Floridian loves this kinda stuff! You have a wonderful eye for placing plants, so it is really nice to see your thought process in designing a bed. I think my garden wants to be yours when it grows up! What a colossal project and almost a scientific approach! I take off my hat! Good job, Meems! i love all your choices to many to comment on all but that blue butterfly bush...wowzers. so pretty. i will be looking forward to seeing this one in person at some point. you are one hard working gardener. bravo...dear sis~! Great story. Thank you for the link. The Bulbines are working out well for us and everyone seems happy with how easy they are to grow. 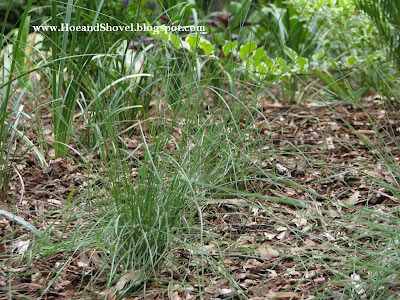 It will be interesting to see if your Muhly grass blooms this year. We usually seed them in December and pot them in June in the full sun so they bloom heavily in September and October. They might also crowd the other plants but they never mind a hair cut. We have even cut tall plants back right before they bloomed in August and the flowers still came up. Looking good, coach. It's wonderful Meems! Thank you for the step by step. It's a good lesson in design planning that helps me to see a process from start to finish. I have one society garlic and am imaging a border with 39 of them! Lucky you to have the space for so many gorgeous beauties! What have the neighbors said about the new border? Of course, I think it's beautiful. Whatever name you call it by, you will be amazed by it's durability. Talk about Right Plant - Right Place! ...and it's chartreuse. 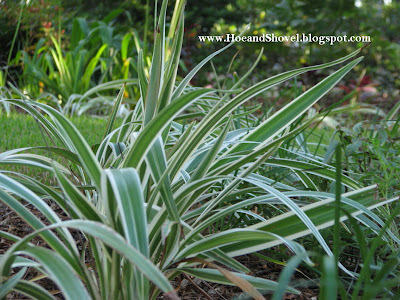 What I enjoy the most about your blog is that all the plants you use are so growable here too. I don't have to sigh enviously and move on to the next site. Lovely project, Meems. I feel as I've been feasting after reding this post! I'm waiting to see how this develops. Oh My Goodness, Meems. I'm so pleased to see all of this--step by step.. It's totally amazing all of the different plants you have and the ways you arrange them. Oh--how I'd love to see your yard in person. Thanks so much for sharing. The maple leaf probably won't bloom until sometime in the fall. Castor bean has much more disctinctly pointed leaves than the maple leaf. Yes, the Firebush can get big but will die back with frost so you don't have to worry about yours. It will come right back in the spring though. Thank you. Even I am surprised at the noticeable growth in the plants already. You and me, Nanamoo... we love the itty-bitty details. Thank you for saying so. :-) What is it with cutting flowers and our humidity? They just don't like it. Although my zinnias have lasted (well some of them anyway)through August. Thanks. Be sure to say hello if you do. Our gardens are notably different than our northern friends. So I knew my fellow Floridians might not mind all my droning. Glad you stopped by. Thank you. Well, it seemed more colossal before I got started than it actually felt like once the project was underway. I enjoyed doing it so much that it fell into place easier than one would think. I was even surprised at how quickly it all came together. There were even more plants that I was hoping to squeeze into that sunny spot. If it weren't for the septic drain fields I think I'd take up all the lawn in exchange for plants. I am still figuring out a way to fit in a small tree up in that narrowed section. Almost started digging again yesterday and 'reason' caught up with me. Thanks so much for the clarification. It makes more sense to me now why that other link (Dave's garden)didn't seem to exactly describe what I had. I've edited the links on the post. You are thinking the same thing as I am... hoping the muhly blooms this fall. It has grown quite rapidly for being such a small starter plant. We will see. The only thing I don't like about it is how it can get shabby looking after it blooms. But like you said ... a simple haircut! I sure hope they don't crowd since I willed myself to leave space between them. LOL Thanks for all the great help! Society garlic is an easy one to over-use here. I can dig up a clump of it and make lots of starters plants in no time. It loves the sun and shoots up its lavender blooms for many months out of the year. Oh, those smooth stones?... none around here for the taking. I purchased them and that 35 feet of stone cost me over $200. The biggest outlay of the whole project. I didn't even spend that much on all the plants I bought. I knew that when planning for it... that's why I used so many of my own transplants. Oh, Sunita, I know just what you mean... I don't have to sigh enviously and move on to the next site. There is something a little extra special when you recognize the plants and know you can relate. Thank you for coming along on this one. I loved every word of it, Meems! 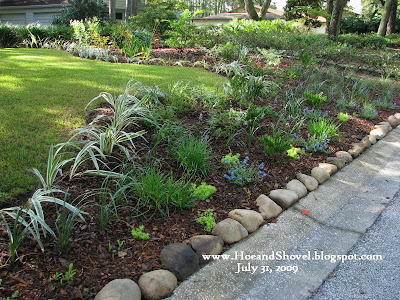 I enjoy before and after photos and descriptions of projects like this, because it gives me many ideas and tips for adding to my own garden areas. Obviously, I couldn't use all the same plants in my Midwest garden that you have, but the steps you took in creating this are very helpful. 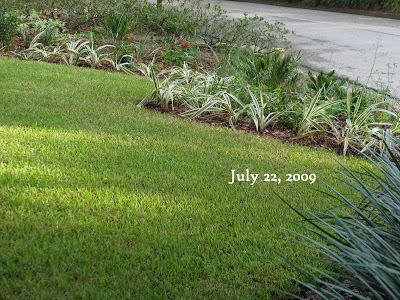 I'm still amazed you managed to remove all the sod in just a week in the Florida heat! The finished garden is beautiful, but it's going to look even more lush in the coming years. Fantastic post! I read it all. I find your step by step instructions helpful. I don't recognize half of the plants but they are all mighty pretty. What a difference! Meems, lovely post, read every word. I have a very similar bed, though smaller, so your thoughts are very helpful. I want to replant my front bed and make it easier to maintain. I can translate your plants into ones that are happy in our climate but I am not good at restricting myself to fewer plant varieties! I do hope Muhly grass will be come available here soon! That was a long post - but a great lesson in putting in a new bed from scratch. Love that you left one strip of sod until the last step . . . You're one smart cookie. 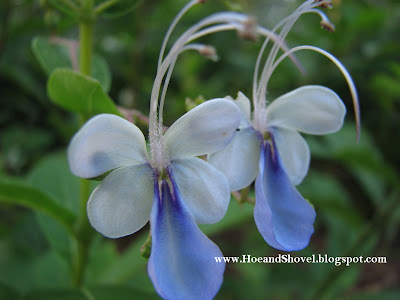 I haven't had much time to read garden blogs the past 6 months (or to write in mine) but Rick Brown tweeted a link to this post and I thought he might be talking about you and your beautiful garden. Have a wonderful Christmas, Meems. May God bless you and you bless so many.